Compiled in 2001 to commemorate the passing of an era, Hatred of Capitalism brings together highlights of Semiotext(e)’s most beloved and prescient works. Semiotext(e)’s three-decade history mirrors the history of American thought. 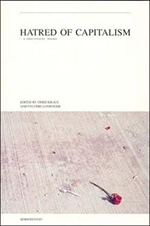 Founded by French theorist and critic Sylvere Lotringer as a scholarly journal in 1974, Semiotext(e) quickly took on the mission of melding French theory with the American art world and punk underground. Its Foreign Agents, Native Agents, Active Agents and Double Agents imprints have brought together thinkers and writers as diverse as Gilles Deleuze, Assata Shakur, Bob Flanagan, Paul Virillio, Kate Millet, Jean Baudrillard, Michelle Tea, William S. Burroughs, Eileen Myles, Ulrike Meinhof, and Fanny Howe. In Hatred of Capitalism, editors Kraus and Lotringer bring these people together in the same volume for the first time.